Formerly Diamond was on a CompuLab Intense PC , purchased 2013-04-13, 5 years ago as this is written. But it went into a death spiral. I got an Intel NUC5i5RYH as a home theater machine and was pleased with it; therefore (see the Selection section) I have picked the NUC7i5BNH to become the new Diamond. It arrived on 2017-12-27. A new 500Mb rotating disc was installed, and 8Gb RAM. 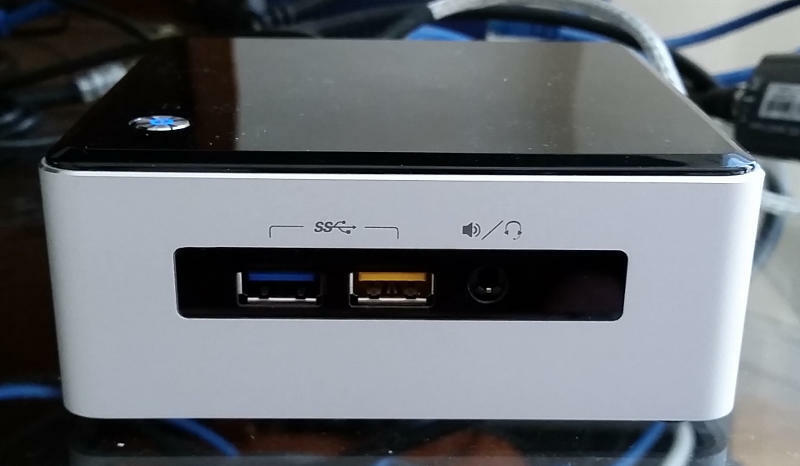 Linux was not actually installed on the NUC; the entire disc was copied lock stock and barrel, including the virtual machine Baobei that is hosted on Diamond. Host for Baobei (virtual), which runs Windows 10. Distro storage and configuration master site. Backup server; other hosts copy to Diamond, and it copies to storage media. Slave directory server ( domain controller ).